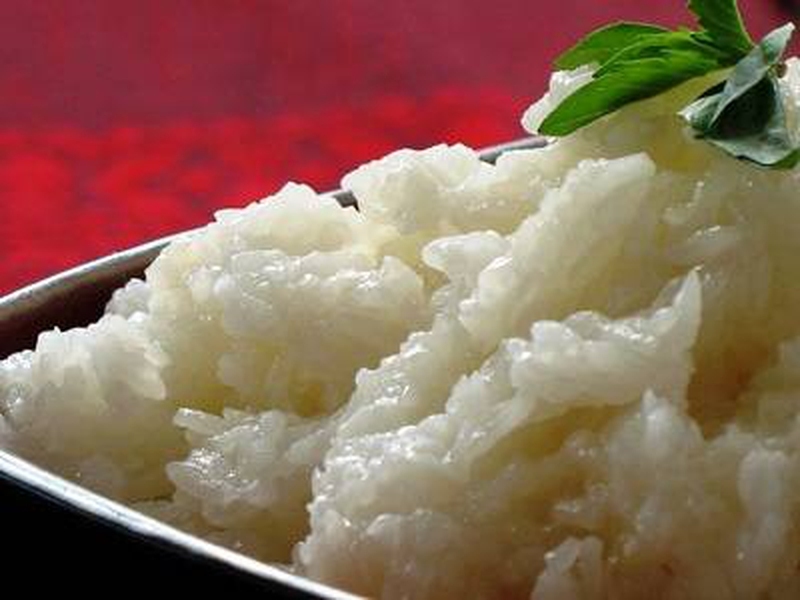 The sweetish Asian rice which has a sticky texture when cooked is also known as the sticky rice or glutinous rice. Do you want to know how to make sticky rice? Basically, you need to ensure that you have the right type of rice as well as the right method of cooking to get the correct texture. These should be basic to make any sticky rice recipe. You can buy the rice which has labels of "long-grain sticky rice", "sweet rice" or "glutinous rice." You can buy it online or at an Asian grocer. The sticky rice can be cooked in 3 different ways as given below. Traditionally sticky rice has been made by steaming. After steaming it, you can make various sticky rice recipes as you like. You start by taking 3 cups of rice in a large pot and covering it with tepid water (2-3 inches) and leave it for 6-24 hours. The longer, the better. Drain and transfer the rice in a steamer basket. Take 2-3 inches water in a wok or pot and place the steamer over it. Steam for 20 minutes without the rice touching the water. Stir the rice so the layers get tossed around. Steam for 5 more minutes and the sticky rice is done. Putting conical steamer baskets in Thai cooks, footed colanders or pasta pots works well. Like steaming sticky rice, you can make your own sticky rice dish according to sticky rice recipes. Take 2 cups of sweet rice in a pot. Add 3 ½ cups of water to the rice and soak for 30 minutes. Add ¾ teaspoon salt, stir well and turn on the flame. Let the water boil after which you can turn down the heat to medium-low. Simmer the rice for 10 minutes with the lid slightly askew, for the steam to escape. Check with a fork if all the water has been absorbed, if not, cook till all the water is absorbed. Turn off the heat, place the lid tightly and let the rice steam for 8 to 10 minutes. The outer shell of rice is hard which will be soft after soaking in water. On cooling and refrigeration, sticky rice becomes stickier and more translucent. Rinse 2 cups of rice under cold running water till the water runs clean. Transfer the rice in the rice cooker and add 2 ½ cups of water. Let the rice soak for 15-30 minutes without turning on the heat. To adjust the absorbed water level, add ½ cup of water or check the measurement on the rice cooker so that water level is still like that with 2.5 cups. Turn on the cooker and let the rice cook for 15-20 minutes. Turn off the heat and let the rice continue to steam for further 15 minutes. Stir the rice and check if the water has been absorbed. You can use Japanese rice for making sticky rice. Sticky rice can be served with soy sauce, vegetables, meat and even in desserts.